Welcome to the OGA Game Jam #2! After the success of the first 'OGA Game Jam' last year. It's back again this year. We see some great games made by not only the OGA community, but other talented indie developers as well making use of the great assets available on OpenGameArt.org. So lets make some more! Every few weeks OGA hosts an 'Art Challenge' based on a theme selected by community member Dannorder/Medicinestorm. You could choose to base your game on the 'Theme' or include the assets created for the 'Art Challenge', or maybe both. If you do, there are 2 extra voting categories to boost your ratings! 2) You MUST use a minimum of 6 Game Assets from OpenGameArt.org. (You can use other assets aswell, so long as you have the rights/permissions to use.) If you are unable to find anything suitable for your project on OGA, you can create your own assets, but you should upload them to OGA website BEFORE the end of the jam so they can be considered as part of the 6 asset rule. By doing so you are also contributing to a great community, and we would love to see it. - Tip: All downloads and favourites are saved in your OGA account for easy use. You can also create a 'Collection'. Add assets you use to this and it will give you a complete 'Credits' file that you can download. - Derivatives: If the license permits you to create a derivative work of an asset, then you still need to credit the original author, and if you do, then please share it on OGA, it would be cool to see it and have it available for others to use. 4) You must have a 'Credits' menu at the title screen/start of your game with a list of all the' OGA' assets you have used in your game. There are no prizes for the winner, or OGA favourite. Just the thrill of taking part! 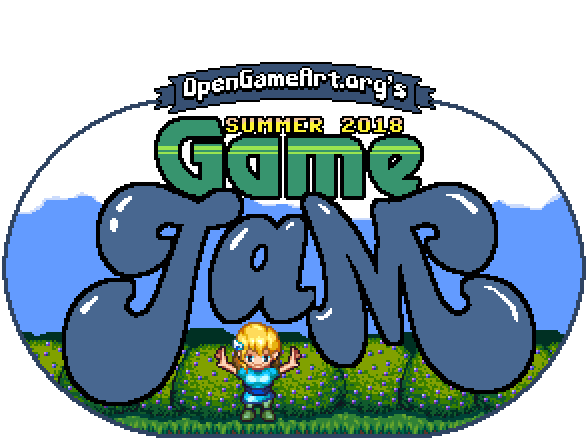 It's worth mentioning that this Game Jam has no affiliation with OpenGameArt itself, and has been put together as some of its members thought it would be good to have a Game Jam.